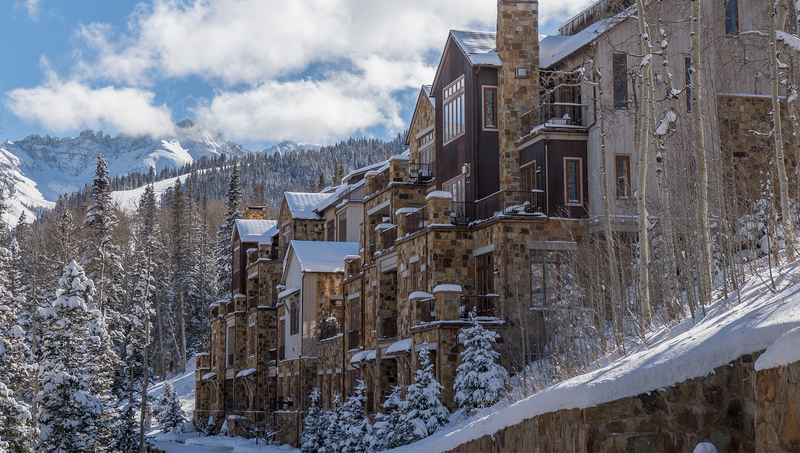 The Villas at Cortina is the Telluride Mountain Village's newest luxury project. 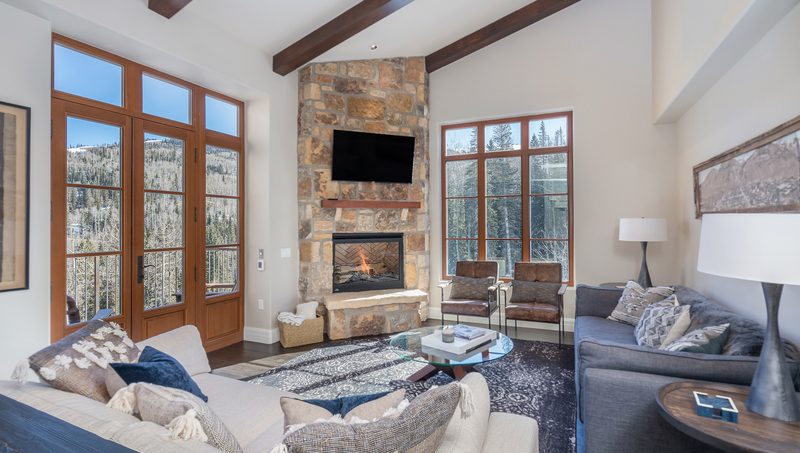 Unsurpassed in its sophistication and elegance, Cortina #1 is a brand new 4-bedroom/3.5-bath condominium boasting unsurpassed views from a ski-in/ski-out location. Exquisite finishes include stone and timber exterior, reclaimed antique pine flooring, Carrera and Calcutta marble and gourmet appliances. The elevator from the common garage opens on the third floor and the entry door to Cortina Unit 1 is in front of you. Entering the front door you are welcomed into the space by a long hall with antique wood floors that lead to the living spaces, framed by large windows that are filled with stunning mountain vistas. 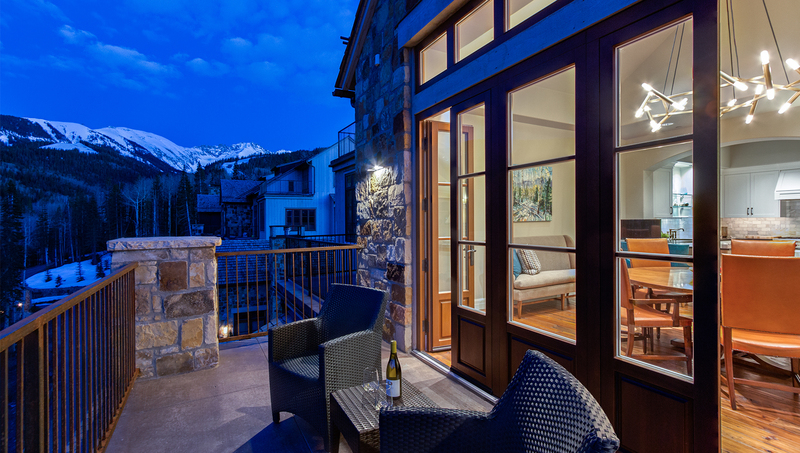 Stylish French Doors framed in European Mahogany lead to a large terrace, beckoning you outside to enjoy the views of the Sneffels Range in the clean mountain air. The dining room features a large, round table with seating for eight in front of a gas fireplace wrapped in native stone. The adjoining living room features modern furnishings and a large flat screen TV. 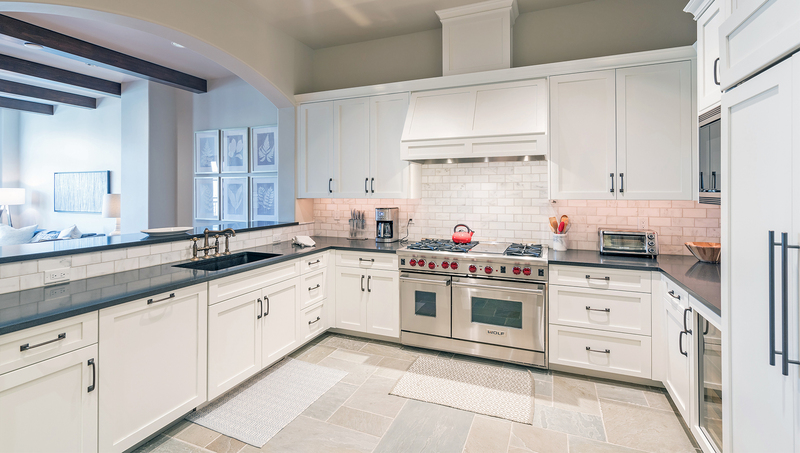 The gourmet kitchen completes the living spaces. 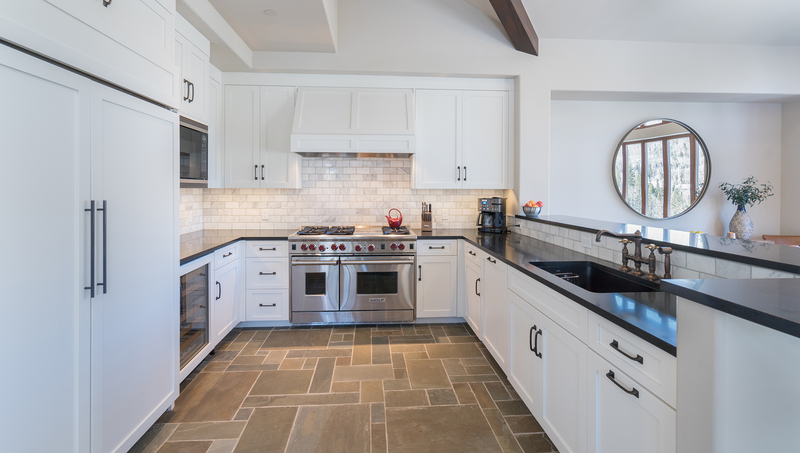 With granite counter tops, handmade cabinetry and SubZero/Wolf appliances, this kitchen will satisfy the most discerning chef. Back in the entry hallway you will find a convenient half bath, as well as the entry for the guest master suite with king bed, gas fireplace, en suite bath with soaking tub and shower. Descending the stairs to the lower level brings you to an inviting den behind antique barn doors that doubles as a bedroom with a queen bed with twin bunk. There is a large flat-screen TV in this room as well. Another guest bedroom on this level has queen bed. And a full bathroom is shared between them. The master suite is on the right. It features a king bed, a gas fireplace, a private terrace and mountain views, while the master bath has a steam shower, a soaking tub and marble vanities. The Villas at Cortina are located on the Sundance ski trail for seamless ski-in/ski-out access. The unrivaled amenities and services include a year-round plunge pool and outdoor spa, a fitness center, his-and-her's steam rooms, a ski locker room, and spa treatment rooms. Concierge services are available and guests at Cortina can take advantage of local shuttles in a Cadillac Escalade. Sea to Ski invites our guests to discover and enjoy this new gem in the Mountain Village. 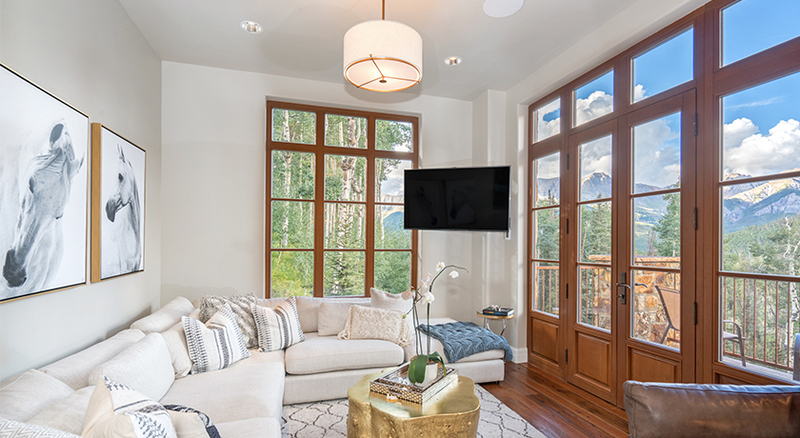 The Villas at Cortina is the Telluride Mountain Village's newest luxury project. Unsurpassed in its sophistication and elegance, Penthouse 12 is a brand new four bedroom and three and a half bathroom condominium boasting spectacular views from a ski-in/ski-out location. Exquisite finishes include stone and timber exterior, reclaimed antique pine flooring, Carrera and Calcutta marble and gourmet appliances. 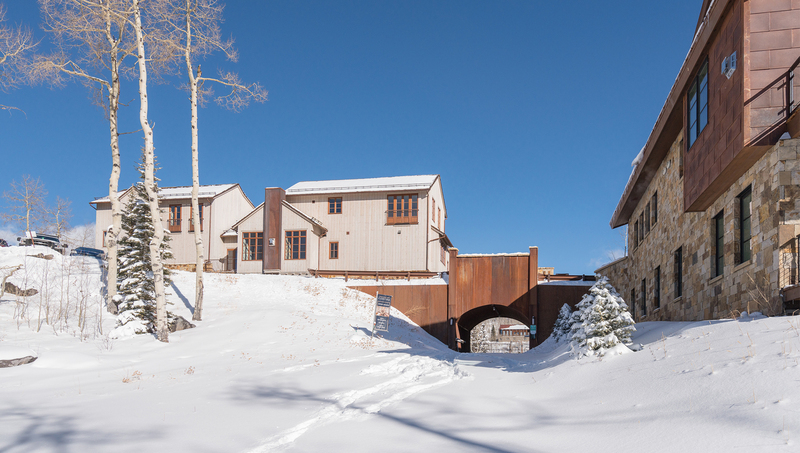 Direct trailside ski access onto Sundance ski run. Bedding: King, King, Queen, Twin Bunk Bed. This condo is accessed via the elevator. Entering the front door you are welcomed into the property's open floor plan, surrounded by large windows that frame the spectacular mountain vistas. The antique wood floors and mountain contemporary design under vaulted ceilings are the perfect complement to the thoughtful design. The living room features a large gas fireplace and a spacious terrace that extends the living spaces outdoors. There is a flat screen TV, and stereo to keep everyone entertained. The adjoining dining room features a large rectangular table with seating for eight and a second entrance to the outdoor terrace. The kitchen, framed under a unique archway, features Wolf and Sub-Zero appliances and a plethora of counter space. There are two stools at the kitchen bar for additional seating. There is a half bath on this level as well. The private laundry facilities are located on this level. Three of the bedrooms are located one level down. The guest master suite has a king bed, a flat-screen TV, a gas fireplace and en suite bath with a stand-up shower. The next bedroom contains a queen bed and a flat-screen TV. It shares a hallway bath featuring a stand-up shower with the nearby bedroom that has a twin-sized bunk bed and flat screen TV. The master suite is found upstairs on the top floor and has a king bed, a flat-screen TV and access to a private terrace, while the en suite features double vanity sinks and a steam shower. At the end of a walkway past the guest master is the ski locker that is located just steps from the ski-in/ski-out tunnel. So, whether skiing, hiking or trail-running, this property provides direct access right outside the door. 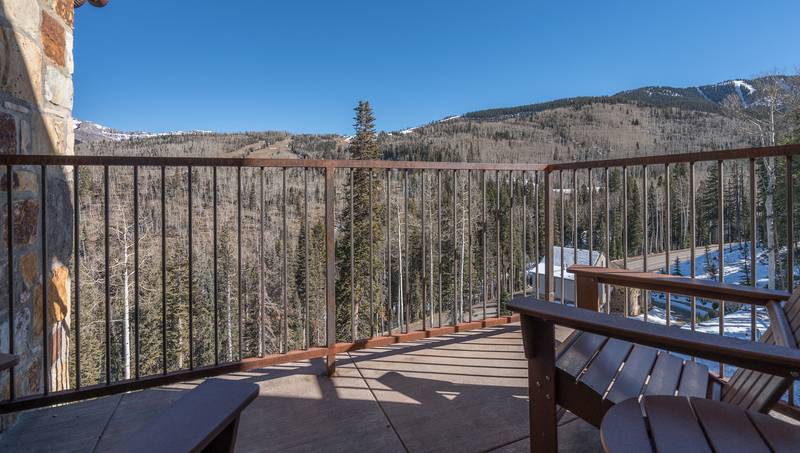 Cortina Penthouse 12 has wireless Internet and garage parking. 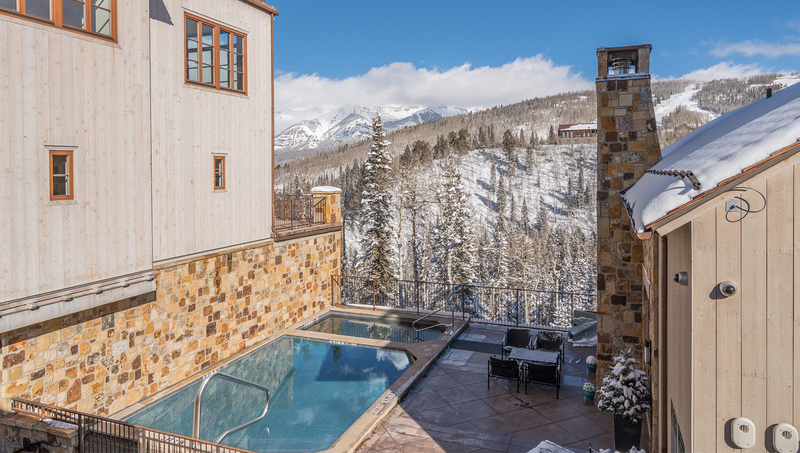 The Villas at Cortina boast a spectacular owner's lounge and patio area, featuring a hot tub, a plunge pool, a gas grill and eye-popping views of the San Juan Mountains. The common areas of Cortina also feature a fitness center, his-and-hers steam rooms and a game room. Guests also enjoy free rides throughout the Mountain Village in Cortina's spacious Cadillac Escalade. Travelers seeking a respite from the ordinary will be impressed by the design and elegance of Cortina Penthouse 12. 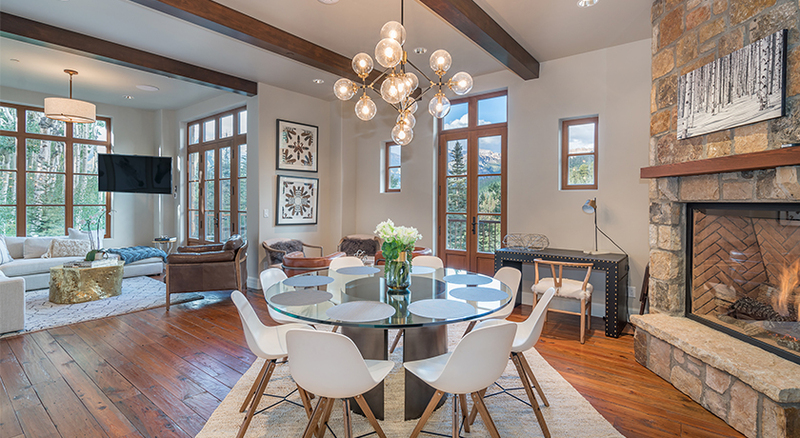 The Villas at Cortina is the Telluride Mountain Village's newest luxury project. 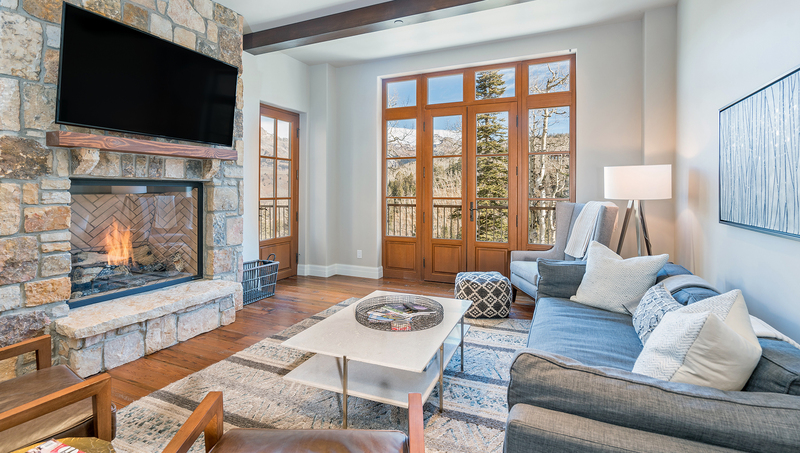 Unsurpassed in its sophistication and elegance, Cortina #3 is a brand new three-bedroom/three and a half-bathroom condominium boasting unsurpassed views from a ski-in/ski-out location. Exquisite finishes include stone and timber exterior, reclaimed antique pine flooring, Carrera and Calcutta marble and gourmet appliances. The elevator from the common heated garage opens on the third floor and the entry door to Cortina Unit 3 is down the hall to the right. Entering the front door, you are welcomed into the space by a brief entry hall with antique wood floors that lead to the living spaces, framed by large windows that are filled with stunning mountain vistas. Adjacent to the entry is the gourmet kitchen. With granite counter tops, handmade cabinetry and SubZero/Wolf appliances, this kitchen will satisfy the most discerning chef. 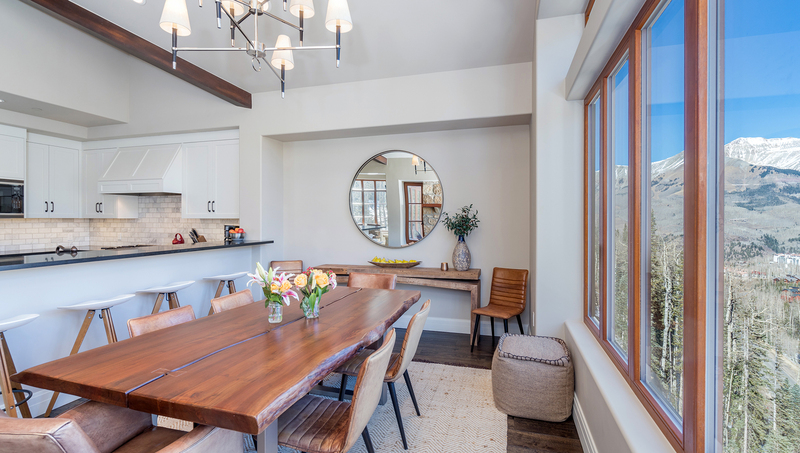 Past the open kitchen is the dining area featuring a modern wood dining table with seating for six. Stylish French Doors framed in European Mahogany lead to a terrace, calling you outside to enjoy the views of the Sneffels Range in the fresh mountain air. The adjoining living room features modern furnishings, a large flat screen TV and is drawn together with a gas fireplace wrapped in native stone. Located off of the living areas you will find a convenient half bath, as well as the entry for the guest master suite with king bed, gas fireplace, large flat screen TV, large windows with mountain views, en suite bath with soaking tub and shower. Descending the stairs to the lower level brings you to an inviting seating area with. Another guest bedroom on this level has queen bed, large flat screen TV, mountain views, en suite bath with a shower. The master suite is on the right. It features a king bed, a gas fireplace, large flat screen TV, a private terrace and mountain views, while the master bath has a steam shower, a soaking tub and marble vanities. The Villas at Cortina are located on the Sundance ski trail for seamless ski-in/ski-out access. The unrivaled amenities and services include a year-round plunge pool and outdoor spa, a fitness center, his-and-hers steam rooms, a ski locker room with boot warmers, and a spa treatment room. Guests with Sea to Ski enjoy full concierge services for dinner or activity reservations, grocery shopping and equipment rentals. Additionally, guests at Cortina can take advantage of local shuttles in a Cadillac Escalade. Sea to Ski invites our guests to discover and enjoy this new gem in the Mountain Village. 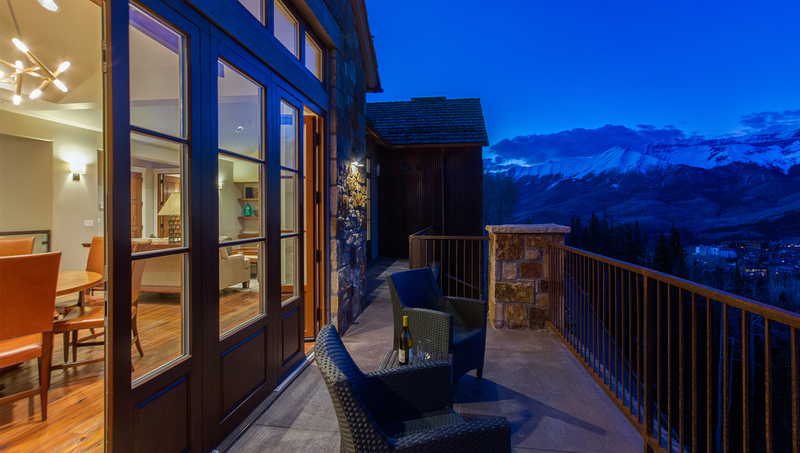 The Villas at Cortina is the Telluride Mountain Village's newest luxury project. 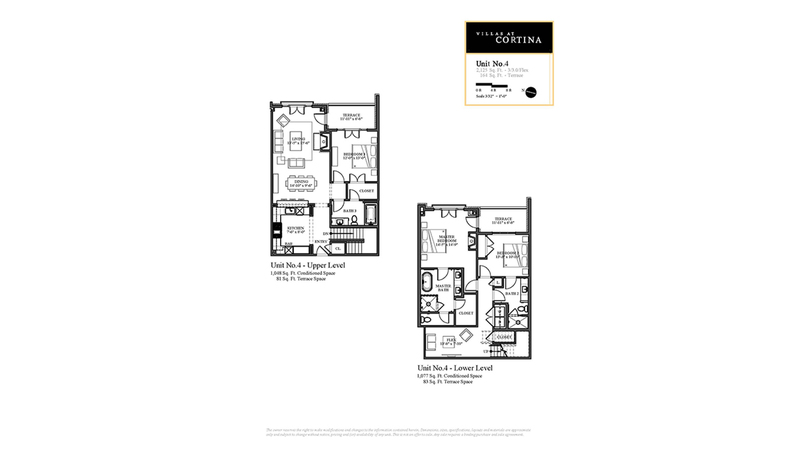 Unsurpassed in its sophistication and elegance, Cortina 4 is a brand new three-bedroom/three-bathroom condominium boasting unsurpassed views from a ski-in/ski-out location. The elevator from the common heated garage opens on the third floor and the entry door to Cortina Unit 4 is at the end of the hall on the right. Entering the front door, you are welcomed into the space by a brief entry hall with antique wood floors that lead to the living spaces, framed by large windows that are filled with stunning mountain vistas. Adjacent to the entry is the gourmet kitchen. 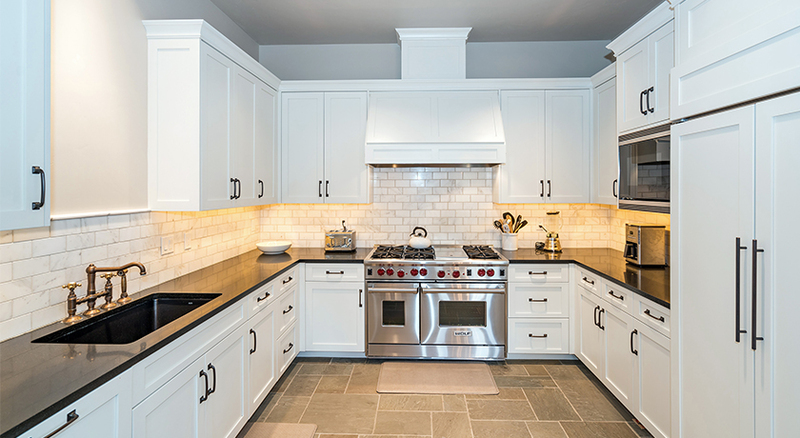 With granite countertops, handmade cabinetry and SubZero/Wolf appliances, this kitchen will satisfy the most discerning chef. 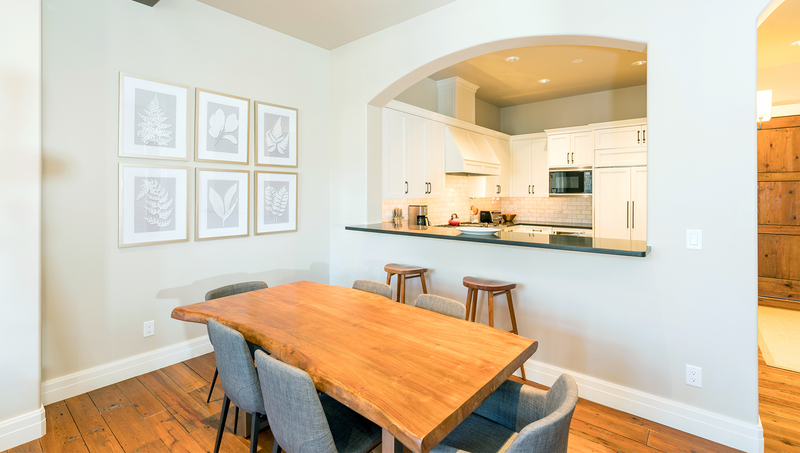 Past the open kitchen is the dining area featuring a modern wood dining table with seating for six. The adjoining living room features modern furnishings, a large flat screen TV and is drawn together with a gas fireplace wrapped in native stone. Stylish French Doors framed in European Mahogany lead to a terrace, calling you outside to enjoy the views of the Sneffels Range in the fresh mountain air. Located off of the living areas you will find the first guest bedroom with queen bed, large flat screen TV, large terrace with mountain views. 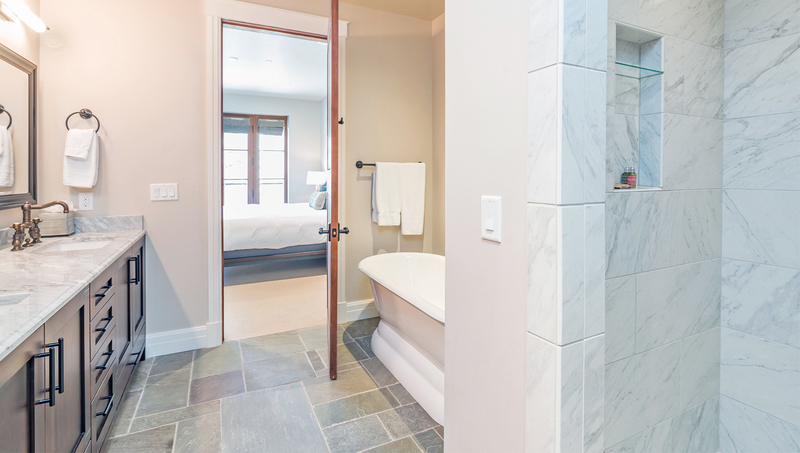 The full bath across the hall with stand-up shower serves this bedroom and acts as the powder room for the living spaces. Descending the stairs to the lower level brings you to an inviting seating area. Another guest bedroom on this level has a queen bed, a large flat screen TV, mountain views from the shared terrace and en suite bath with a shower. The master suite is on the left. 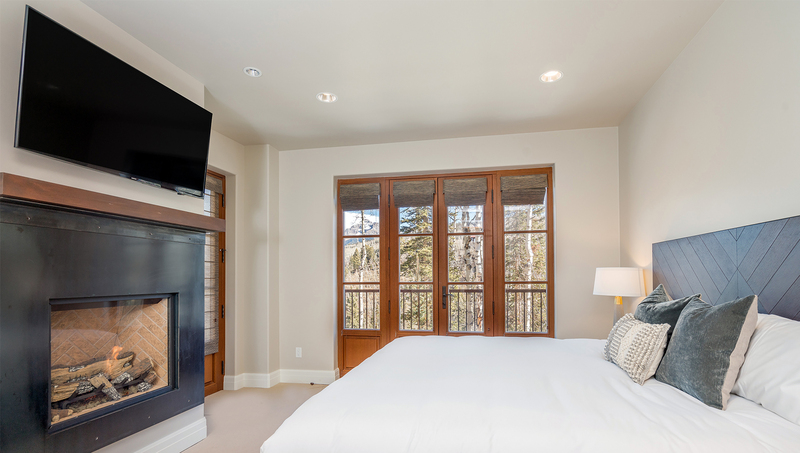 It features a king bed, a gas fireplace, large flat screen TV, a shared terrace and big mountain views, while the master bath has a steam shower, a soaking tub and marble vanities. 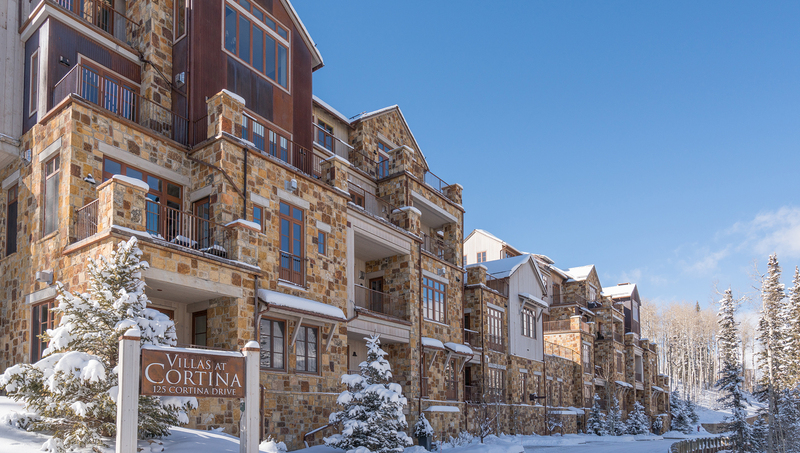 The Villas at Cortina is the Telluride Mountain Village's newest luxury project. 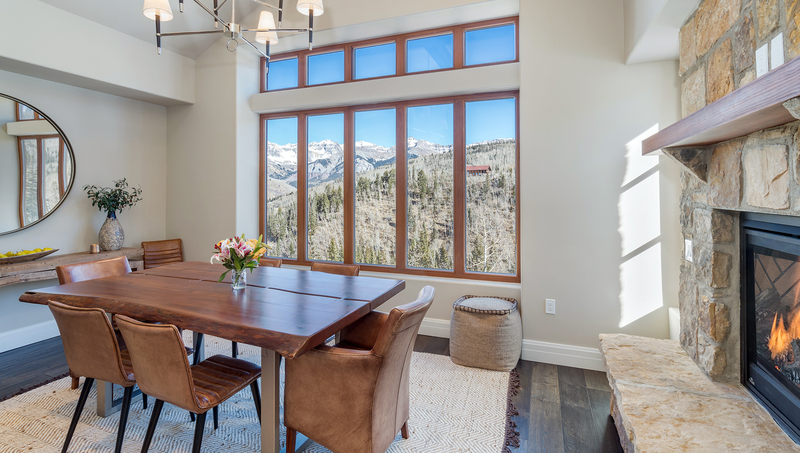 Unsurpassed in its sophistication and elegance, Penthouse #8 is a brand new 4-bed/3.5-bath condominium boasting unsurpassed views from a ski-in/ski-out location. Exquisite finishes include stone and timber exterior, reclaimed antique pine flooring, Carrera and Calcutta marble and gourmet appliances. Direct trailside ski access . The elevator from the common garage opens on the 5th floor and the entry door to Penthouse 8 is down the common hallway to the right. There are a total of three unit doors on this level and Penthouse 8's front door is the last door on the left. Entering the front door you are welcomed into the property's open floor plan, surrounded by large windows that frame the spectacular mountain vistas. The antique wood floors and mountain contemporary design under vaulted ceilings are the perfect complement to the thoughtful design. 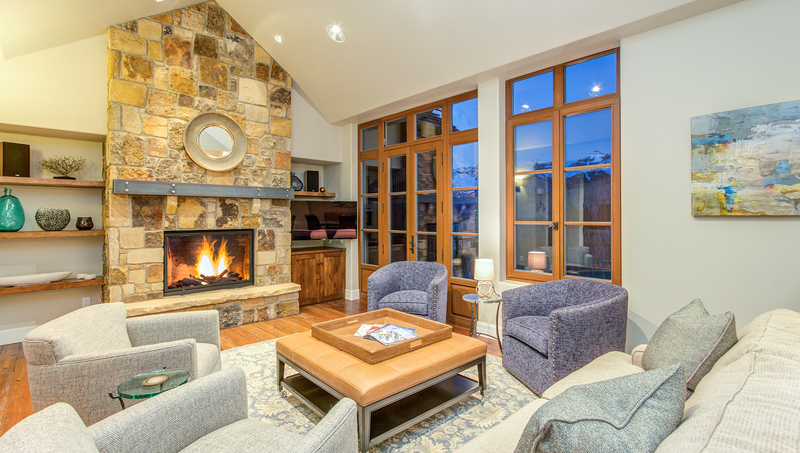 The living room features a large gas fireplace framed in Telluride Gold, a beautiful stone that is quarried locally, and a spacious terrace that extends the living spaces outdoors. There is a flat screen TV, blue-ray and stereo to keep everyone entertained. The adjoining dining room features a large circular table with seating for 8 and a second entrance to the outdoor terrace. The kitchen, framed under a unique archway, features Wolf and Sub-Zero appliances and a plethora of counter space. There are 2 stools at the kitchen bar for additional seating. There is a half bath on this level as well. All of the bedrooms are located one level down. The Master Suite has a King Bed, a flat screen TV, a gas fireplace and access to a private terrace, while the en suite features double vanity sinks and a steam shower. The next bedroom contains a day bed/sofa sleeper and a flat screen TV. It shares a hallway bath featuring a standup shower with the nearby bedroom that has a Queen Bed and flat screen TV. The Guest Master Suite is found at the end of the hall and has a Queen Bed, a flat-screen TV and en suite bath with a standup shower. The private laundry facilities are located on this level. 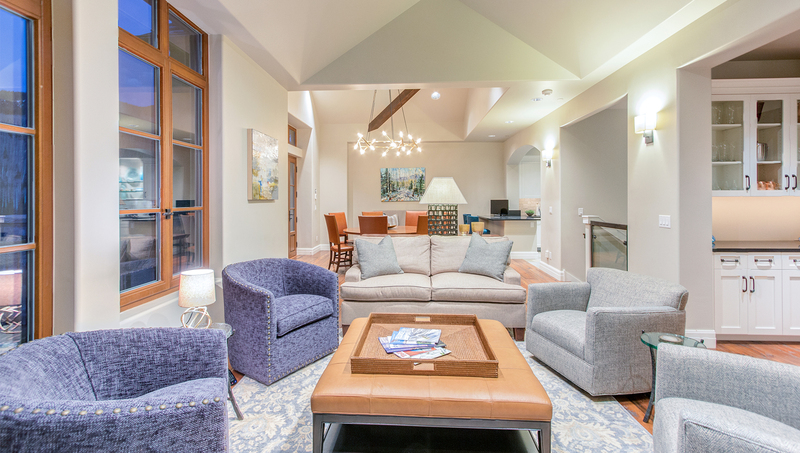 Cortina Penthouse 8 has wireless Internet and garage parking. 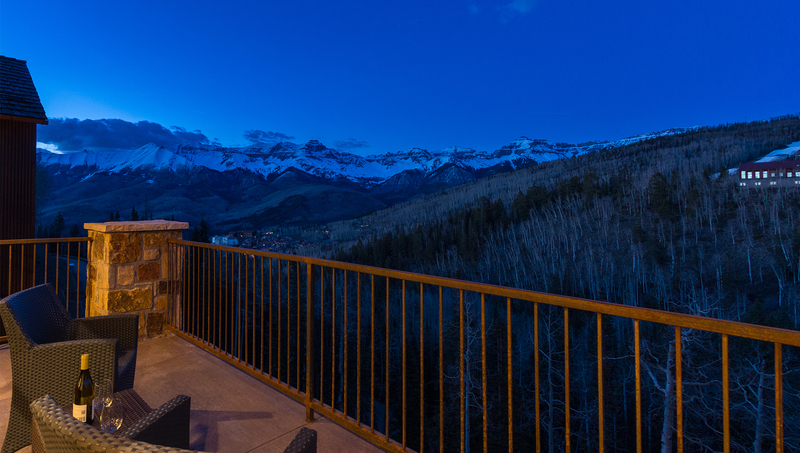 The Villas at Cortina boast a spectacular owner's lounge and patio area, featuring a hot tub, a plunge pool, a gas grill and eye-popping views of the San Juan Mountains. Guests also enjoy free rides throughout the Mountain Village in Cortina's spacious Cadillac Escalade. Travelers seeking a respite from the ordinary will be impressed by the design and elegance of Cortina Penthouse 8.